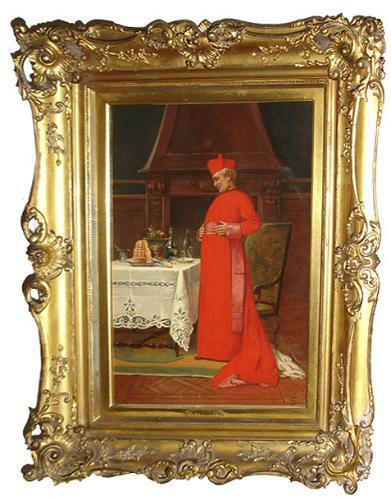 A Colorful Albert-Joseph Penot (1862-1930) Signed 19th Century Oil on Canvas entitled "The Cardinal after his Meal" - C. Mariani Antiques, Restoration & Custom, San Francisco, CA. The Cardinal After His Meal, A Colorful 19th Century Oil by Albert-Joseph Penot (1862-1930). The signed painting depicts a cardinal in traditional vibrant vestments, standing in an interior setting beside a dinner table heaped with fruit, cakes, and wine. The piece is highly reminiscent of Penot’s A Reclining Cardinal sold at Sotheby’s London on May 13, 1998, lot 389. Height: 26 1/2", Width: 21 1/2"; Depth: 4 1/4"